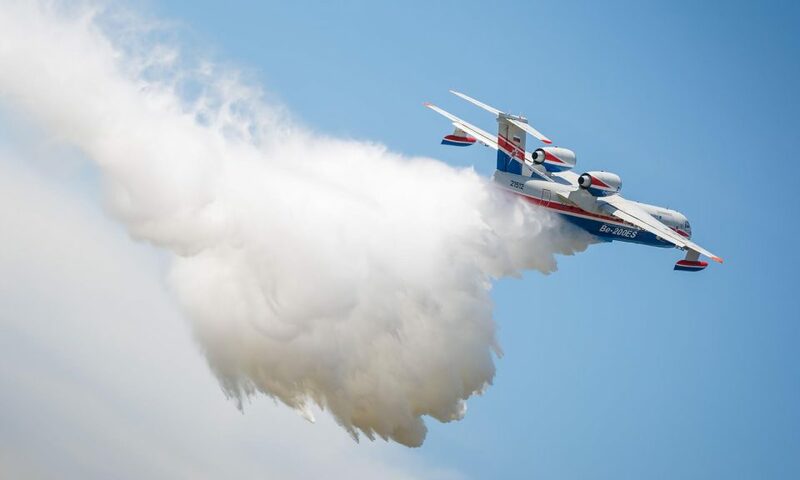 Left: The Russian Beriev Be-200 releases water to fight fires in Taganrog Russia. Photo: iStock. 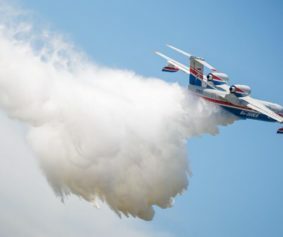 With thousands of wildfires hitting the US every year, the solution to limit the devastation could be the best firefighting aircraf available – the Russian Beriev Be-200. Right now California is once again on fire. As this is written a fast-moving wildfire is surging in Ventura and Los Angeles counties endangering some 30,000 homes. In 2017 Texas had 9827 wildfires, California 9560, North Carolina 5125, and Georgia 3929. But that is only part of the story – terrible wildfires have also been experienced in Colorado, Washington, New Mexico, Alaska, Arizona, Idaho, Utah, and Wyoming – among others. While the United States is still the world’s aviation leader, it has never made one type of aircraft that is a purpose-built firefighter aircraft, even though big fires plague many areas of the country year-round. The world leaders in airborne firefighting are Canada and Russia. Canada makes the CL-415, known as the Bombardier Water Bomber, which can scoop up 6,100 liters of water, and, if desired, can be mixed with a chemical retardant. It is a turboprop aircraft that was built for the single mission of firefighting and was the successor to the older and smaller CL-215. California uses both. The Canadian aircraft have been used worldwide and have been effective.But not as effective as the Russian firefighting aircraft. Russia’s Beriev Be-200 Altair is a multipurpose amphibious aircraft designed by the Beriev Aircraft Company and manufactured in Russia by Irkut. Built for firefighting, search and rescue, maritime patrol, cargo, and passenger transport, it carries 12 tons (12,000 liters) of water in eight separate tanks and laso has six separate tanks for chemicals that can be mixed with water. It has been used in Europe and Asia including Italy, Portugal, Greece, Azerbaijan, Israel and (in a search and rescue operation) Indonesia. The plane flies at about 700km/h whereas the US-2 flies at a maximum speed of 580km/h and the CL-415 at 359km/h. The higher speed of the Be-200 (which is turbofan-powered, while the others are turboprop) shortens the time to station significantly, an important variable in a fire emergency. Despite its considerable operational success, acceptance of the Be-200 in the US has yet to be achieved. Beriev is represented in the US by International Emergency Services housed at the Santa Maria airport in California. The company has been working with California authorities and the Federal Aviation Administration to get the plane certified in the United States. But as a loaner from Russia to the US, FAA certification would not be needed initially. The aircraft already has EASA (European Aviation Safety Agency) certification, clearing the path for FAA approval. In the US, responsibilities for firefighting are in the hands of state and local authorities and the federal government through the US Forest Service and its Wildland Fire office. The US Forest Service, and Bureau of Land Management own, lease, or contract for nearly 1,000 aircraft each fire season, with annual expenditures in excess of $250 million in recent years. Many of the planes are commercial or former military aircraft that can be employed for firefighting if they are not otherwise in use. The Forest Service also has some large aircraft including one DC-10 under exclusive use contracts but, because of budget constraints, the number is being cut from 20 aircraft to 13. In earlier years the US Forest Service had 44 large air tankers under exclusive use contracts, but after two former military aircraft crashed, killing five aviators, many older aircraft were eliminated for safety reasons. Most of the leased planes are converted for firefighting and were originally passenger aircraft (except for the C-130). Older converted planes are expensive to maintain and operate and are often not in the best operating condition, leading to delays, lack of availability and accidents. C-130s have condition issues, particularly wing box cracks that can lead to catastrophic failure unless wing boxes are replaced (an expensive and time-consuming exercise). There is a famous video showing a C-130 losing its wings in a firefighting tragedy. Saving lives and property is the first reason, and the goal of all firefighting. Given the major challenges in safeguarding forest land and wildlife, access to top-rated firefighting equipment is an urgent matter, more so when the price is right. As things currently stand, the Russian Beriev is one of the most cost-effective alternatives out there and will help stretch both federal and state budgets. Secondly, the Russian planes proved to be effective operationally and the Russians are willing to lease them as a business proposition. Leasing aircraft should be permissible even under current US sanctions on Russia related to the Ukraine situation, the annexation of Crimea by Russia, alleged US election meddling by Russia and the alleged poisoning by a nerve agent of the Skripals in the UK. Leasing aircraft to deal with emergencies is certainly not an endorsement of Russia or its policies. The administration of US President Donald Trump may be looking for places where some positive cooperation with Russia is possible. Trump will be meeting with his Russian counterpart Vladimir Putin at the upcoming Group of 20 Summit in Buenos Aires (November 30 to December 1). Here is an item that could be on the table. *A version of this commentary was posted on AsiaTimes,com, on Nobember 11, 2018.